As one of the top performance bicycle manufacturers in the world, Argon 18 offer products of impeccable quality for the highest echelon of our sport. By facing challenges head-on, constantly pushing limits and utilising cutting-edge technology they allow cyclists and triathletes across the world to reach their highest level. Argon 18 was founded in 1989 by now-retired pro road racer and Olympian Gervais Rioux. 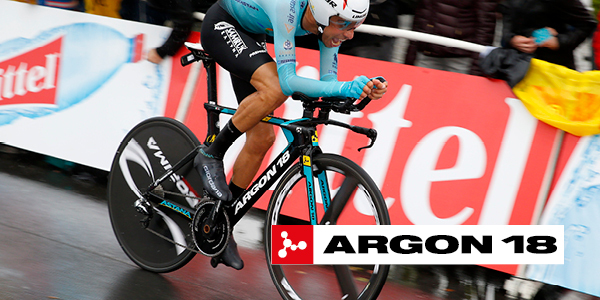 With accolades of over 1500 race starts and 150 wins, this sport passion is the foundation of Argon 18. From Gervais’ humble beginnings in a boutique Montreal bike shop, their main focus was, and remains, to design and build the best bikes in the world and have them race at the highest levels in cycling and triathlon. With stage wins from Astana on the Gallium Pro and Nitrogen Pro in the 2017 Tour de France, Giro d'Italia and overall victory in the Cirterium du Dauphine proving their design prowess, as well as dominating the Kazakstan National Time Trial on the E-118. The Danish National Track cycling team push the Electron Pro to its limit. 101 Argon 18 Triathlon bikes could be found at the 2016 Ironman Kona World Championships, being raced by a number of top flight athletes. From the fork to the seat stays, every aspect of Argon 18 bikes are designed in line with their flagship technologies that make them one of the best in the world. All bikes purchased for delivery will be un boxed fully assembled, go through a 28 point pre delivery inspection including a ride test, before being packaged and re boxed for delivery.